Lenten rose, Helleborus xhybridus, in bloom. Helleborus ×hybridus is a group of evergreen, late-winter or early-spring flowering perennials in the buttercup family (Ranunculaceae) with the common names of hellebore, oriental hellebores, or Lenten rose (the name Christmas rose refers to H. niger). Helleborus (hellebore) is a small genus of about 20 species of herbaceous perennials native to Europe and Asia. 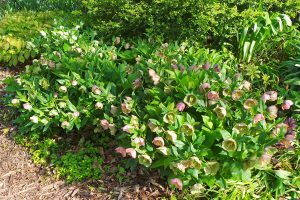 The species are rarely used in gardens as hellebores hybridize easily and many improved garden plants with superior flowering and flower colors have been developed. Formerly known as Helleborus orientalis hybridus — a confusing and incorrect name since H. orientalis is a distinct species — garden hybrids are collectively called H. ×hybridus (although many times they are still offered in the trade as H. orientalis). These Lenten roses are hybrids of at least nine species, but there are additional interspecific hybrids, such as H. ×ballardiae (H. niger crossed with H. lividus), that are offered as ornamental plants for the garden. 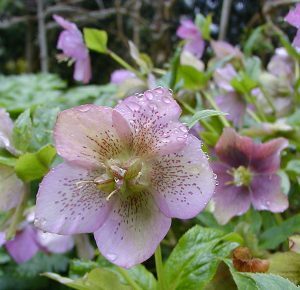 Lenten rose is hardy from Zone 9 to Zone 5, and colder when plants have with winter protection such as good snow cover. Lenten rose in a garden. 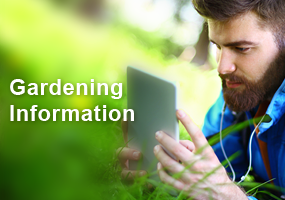 Mature plants can form clumps that are 18” to 24” tall and 24” to 30” wide. The glossy, deep green foliage can be quite variable in color and shape, even within the same hybrid. The leaves are divided into 7 to 9 segments with an umbrella-like shape. They have tough, almost woody stems with leaves and terminal inflorescence on the same stem. The toothed, leathery foliage remains attractive throughout the growing season, remaining evergreen in mild climates and even persisting under snow (but decline over the winter, often flattened on the ground). Lenten rose forms a large clump (L) of deeply divided, umbrella-like leaves (LC) that persist even under snow (RC), although the evergreen foliage often is flattened to the ground by the following spring as new shoots emerge (R). What appear to be the colored petals are really sepals. Flower buds form during the previous summer, with the distinctive, 1-2” wide, long-lasting flowers blooming in early spring with daffodils and tulips. Flower spikes emerge from the underground rhizome in late winter. Five petal-like sepals (a modified calyx) surround a ring of small, yellowish-green, tubular, nectaries in an open, bell shape. The nectaries are actually the petals modified to hold nectar. Inside the ring of petals there are numerous stamens and several pistils. After the flower is pollinated the petals and stamens fall off, but the sepals do not drop, remaining on the plant for 1-2 months or more (and probably contribute to seed development). Mature plants often have 50 or more flowers per plant. Blooms make good cut flowers and their seed heads add interest in dried arrangements. Drooping buds (L and LC) open with the flowers facing downward (C) to expose the stamens and stigmas (RC) and ring of cup-like nectaries that are modified petals (R). Flowers of hellebore garden hybrids come in a rainbow of colors in both single or double forms. Flower color ranges from pure white to a plum color bordering on black, with clear red, pink, yellow, green or cream; others speckled, spotted and mottled on the inside of the flower; and some with picotee edges (narrow margins of a darker color). The outside of the sepals is often green-tinged, and most flowers become greener as they age. Flowers of hellebore hybrids may be single or double and come in a range of colors and markings. Flowers are often followed by unusual seed pods that offer ornamental interest and can produce viable seeds if left on the plant. The carpels eventually dry and split to release the sort of bean-shaped, shiny black seeds, each with a white elaiosome, that become wrinkled with age. The petals and stamens drop off (L), leaving the carpels (LC) which grow larger as the seeds develop (C), eventually drying and opening (RC) to release the bean-shaped seeds (R). Lenten rose combines well with many other shade perennials. 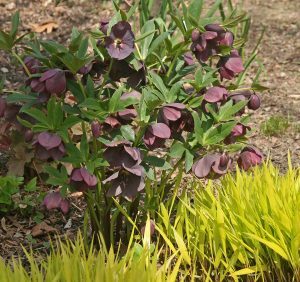 Lenten roses are an outstanding combination plant for adding color, texture, and habit to the ornamental shade garden, in areas between deciduous shrubs and under trees, or naturalized in woodland areas. They can be the stars of the early spring garden as specimen plants, in masses as a foil for other spring bulbs and could even be used as a tall ground cover. 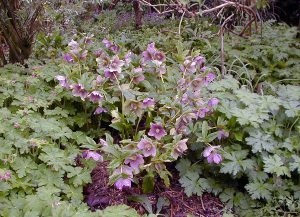 Lenten rose combines well with other spring-blooming perennials such as barrenwort (Epimedium spp. ), wood anemone (Anemone nemorosa) and Hepatica. Later in the season the foliage provides a nice backdrop for hostas and other shade perennials.They are also excellent for planting on a hillside above a path where the downward-facing flowers can be viewed from below. Lenten rose does best in partial to full sun. 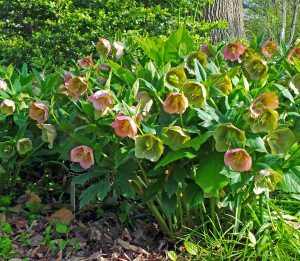 Lenten rose does best in partial to full sun and well-drained, humus-rich and fertile garden soil. In the Midwest they will grow well in sun, but in more southern locations require some shade. 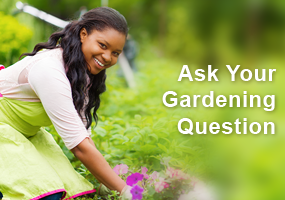 They are relatively drought tolerant once established, but do best with consistent moisture. They are very sensitive to soggy soil, so the site must have good drainage. This plant requires little maintenance. The previous season’s leaves will be dried and tattered after the winter and are best cut off at the ground as the flowers emerge in the spring. 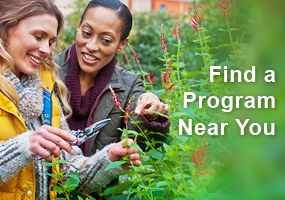 Fertilize in early spring, and mulch in winter (with evergreen boughs or marsh hay) in colder areas. Like other members of the Ranunculaceae, hellebores have alkaloids in the leaves and seeds that can cause mild dermatitis in sensitive individuals, so gardeners should wear gloves when exposure might occur. These same alkaloids make the leaves undesirable to deer and rabbits, but slugs like their flowers. Lenten rose can be propagated from seed or by division. Commercial plants are propagated from seed, division or tissue culture, but germination is slow and it can take four or five years to produce a plant of flowering size, and seedlings will not come true from seed. Seeds ripen in late spring and early summer, and must be sown fresh. Leaving the seed pods on the plants to allow volunteers to sprout is probably the easiest way to get seedlings. 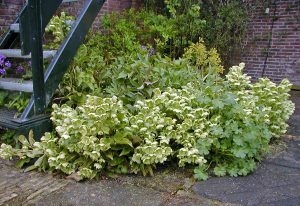 These can be carefully dug to move to pots or other areas of the garden, or left to enlarge the clump. Established clumps can be left alone for 20 or more years, but may be divided (each division should have several crowns), preferably in the fall or at flowering time. The recovery time is slow with division. Have bought many varieties over the years at the MG plant sales. Some have done well and others are very testy and require more attention. The flowers are just so pretty on the darker varieties. I love Lenten roses and have many different varieties. I haven’t tried to propagate them from seed yet, but I will now! Great article. Think I will try some next year. Got one of these at the MG plant sale. Now I know to mulch in winter. Can’t wait til spring. Read for continuing ed. A friend of mine has many of these, just lovely! These are such pretty flowers. I was surprised to find out they are related to butter cups. I am planning a new shade flower bed for the spring and will include these in that bed along with the hostas and bleeding hearts plants. This has been favorite spring flowering plant since my first white helleborus. I always have thought of this as a Christmas rose. I left the Lenten Rose for the new home owner to enjoy and have accumulated a few more varieties to enjoy. I’m not sure that I like how much they spread. There is a bit of maintenance each spring to remove foliage from the past year. They make a beautiful display in clumps and are somewhat okay as a cut flower with other spring flowers. Great information from the article. I thought it was interesting that a clump can grow for 20+ years! Enjoyed this article. This sounds like a wonderful plant for some ground cover in my shade garden area. Beautiful! As we continue to remove invasives on our wetland and wooded area I’d like to plant more spring blooming material ~ winter in WI is too long to go without blooms. This will be a great addition! Enjoyed the article. My clump of Hellebores is growing slowly. The seedlings do not transplant well for me. Thank you. Glad I read this. I had to take out some old barberries last fall and with revamping the area it will be perfect for a couple of these. I hope to find some large plants. I’m older and can’t wait!! in small vases for my kitchen ledge. I am looking forward to finding more colors to plant. They are a bright spot in my shade garden. It was interesting to note that they could be grown in pots. I wasn’t aware of the reseeding and the shiny little bean- like seeds the plant produces. They amaze me in the Spring when I have forgotten what a variety of plants I have. It was interesting to see the name Lenten rose for this plant. A beautiful flower, but can be difficult to actually see due to the downward position of the flower. Planting on a downward slope may help to better position the flower to improved visibility.